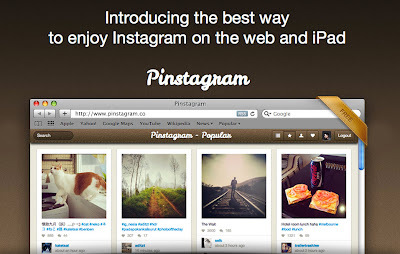 If It's Hip, It's Here (Archives): Pinstagram, The Ultimate Mash-Up. 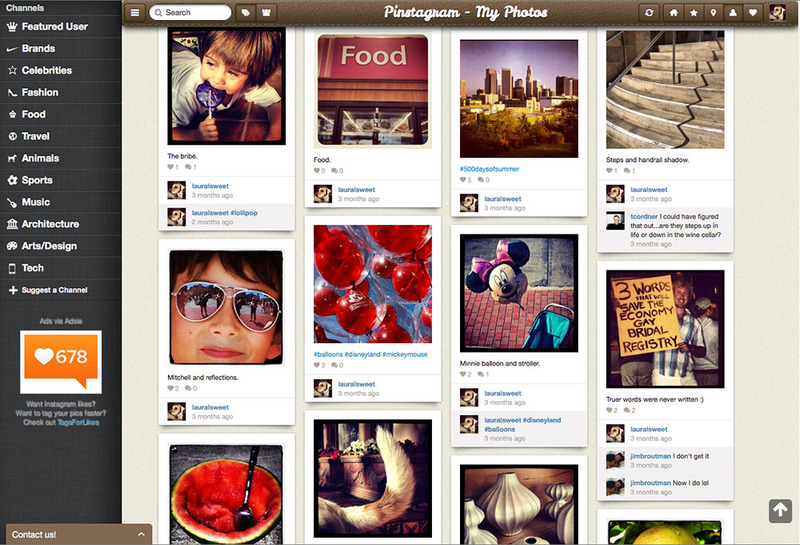 Your Instagram Photos In Pinterest Format. Pinstagram, The Ultimate Mash-Up. Your Instagram Photos In Pinterest Format. I was wondering how long it would take for the ever-growing Pinterest platform to combine with the incredibly popular Instagram app. Not long as you will see with Pinstagram, a new site by co-founders Brandon Leonardo and Pek Pongpaet. We have all seen those mythical hybrid animals, like the zeroed, a mix of zebra and equine, or perhaps the more commonly known beefalo, a mix of buffalo and cow. You may even be familiar with the leopon, the result of breeding a male leopard with a female lion. Hybrids are real. And there are others too, mind you. But it's not all fur and feathers; many such hybrids live on the Internet. Especially sites like Pinstagram, a "Pinterest for your Instagram images," as co-founder Pek Pongpaet describes it. In an increasingly visual Web, it's a wonder that this hybrid didn't come about sooner. 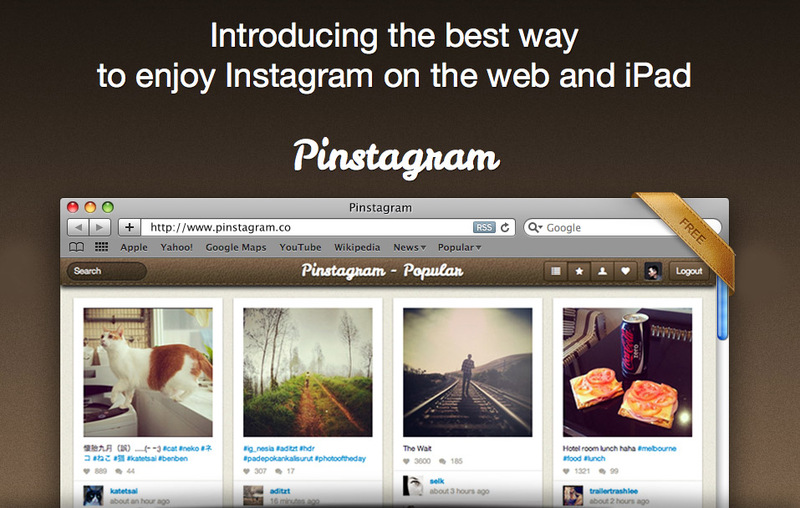 Like most things on the Internet, Pinstagram happened fast. "We were joking one evening about how Instagram is worth $1 billion and how Pinterest's valuation might already be in the $500 million range," says co-founder Brandon Leonardo. "And we were thinking about the idea of a Twitter for Facebook, what that would be like. Then I could tell Pek started thinking about it. The gears started turning; he was visualizing a Pinterest for Instagram." Not more than 24 hours later, Pongpaet had already coded and designed it. This sort of fast turnaround is pretty natural for Pongpaet and Leonardo, who come from a hackathon "get stuff out as fast as possible and ask questions later" type of background. If this sort of idea had popped up within a larger company setting, for example, it would have "taken months," says Pongapaet. Since Pinstagram's debut just a few weeks ago, the site has already seen about 6,400 Facebook likes of Instagram images, thousands of tweets and a few hundred pins. Services like Pinterest and Instagram are integral to the future of the visual Web. No longer do people send photos to document memories; they are lifestreaming as it all happens, with pictures telling the story. It's no wonder that Facebook snatched up Instagram while it still had the chance. "The visual medium has always had international appeal," says Pongapaet. "Sending pictures is very common. If you stick to English, you'll alienate a lot of people. Visual mediums let you transcend all barriers. It takes seconds to process a photo." What about Webstagram, the Instagram Web viewer? Isn't this a sufficient way to view Instragram images on the Internet? For some, it's perfect. But like many news Web sites, Webstagram is organized around "popular," "my photos," "liked," "hot," "photo of the day" and more. It feels more like a news website and less like a glossy, Pinterest-like magazine. "The reason I built Pinstagram is because this is my world view of how Instagram should look on the Web," says Pongapaet. "Our core focus is to recreate the Instagram experience on the desktop and to be able to extend that to our users." 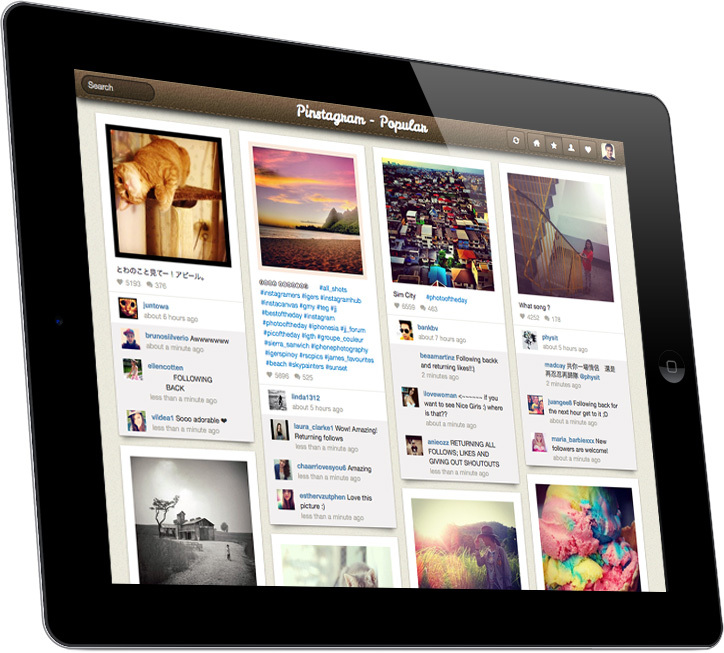 Not everyone wants to see their Instagrams in a Pinterest-like layout, however, and Pongapaet acknowledges that. "There are always different interpretations," he says. "That's what great about art, about having different APIs - people all have different interpretations." Pinstagram just integrated into Facebook Timeline. 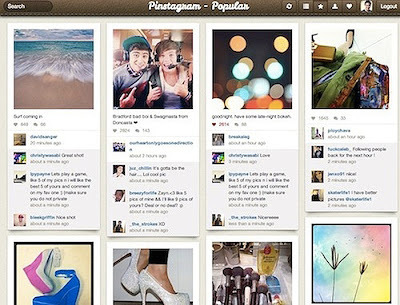 As the Instagram-Facebook integration continues to rollout, so will this nifty Pinterest-Instagram hybrid beast.- by Alicia Eler on May 11th, 2012 for ReadWriteWeb.